Based on her first field assignment as a critical care nurse in Aweil, South Sudan, Australian nurse Edith Torricke-Barton shares her advice about how to best prepare for your time in the field. Do your homework before you get to the field! It’s crucial that you know how to resuscitate all types of patients, whether it’s newborns, children or pregnant women. Our patients travel long distances and by the time we see them they are critically unwell or unstable. Working in a low resource environment means you need excellent clinical assessment skills. You need to recognise a deteriorating patient when all you have is your stethoscope and your five senses because you can’t rely on diagnostic testing in the field. Working in an emergency department, intensive care or in theatre you don’t know what you’re going to be up against. 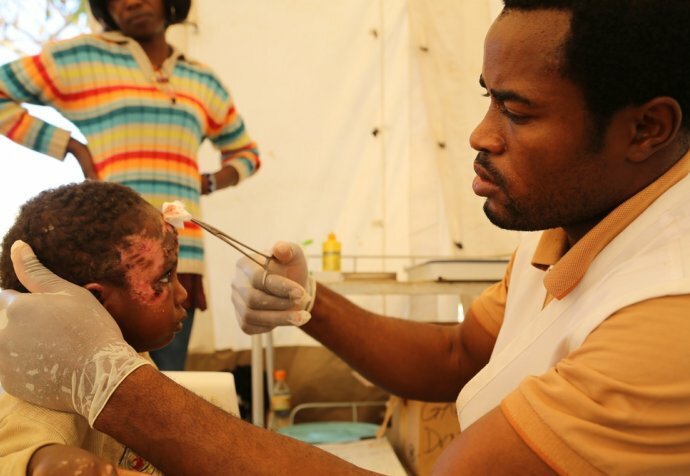 Our patients have comorbidities, poor hygiene and low nutrition which puts them in a vulnerable state. Working in an unstable setting means anything can happen. One time in Aweil the generator went out and didn’t kick back in. While our logisticians jumped in to trouble-shoot, the Intensive Care Units (ICU) were left without power, which meant our oxygen concentrators stopped working. Our patients stopped receiving oxygen as a result and we had to resuscitate four patients simultaneously. We had to urgently call staff and equipment in from other areas of the hospital. It took quick thinking and improvisation. After that day we put a more comprehensive emergency plan into place and practised the new protocols. Good communications skills are essential when you are working in diverse cultural settings and with staff who have had various levels of education. At times you will need to be clear and concise, and at other times you will need to find creative ways to explain things. In Aweil, we ran a nursing skills update class once a week for all staff and had to really be creative in how we were teaching so that everyone understood what we were saying. You also have to accept that communicating during critical times in the ICU or emergency can be tough. In Aweil it was tricky at times to find the balance between being sensitive to cultural customs and also conveying the urgency of the situation. Always expect the unexpected no matter where you are. Things can go downhill in a matter of minutes – you could be resuscitating one child then having to place another arresting child on the bed before you have a chance to properly clean up. Or you might have to perform an emergency tracheotomy, while quickly educating the ICU staff on what it is! It can also be something as wonderful as being asked to assist with a women’s fistula repair campaign when you work in a non-surgical paediatric hospital. We never expected to be housing 40 women in our hospital right before the malaria peak started. With a lot of running around and hard work we got it all going. Just remember to be open, creative and innovative with your solutions. 6. Do your homework before you get to the field! It’s good to be an all-rounder or a specialist in generalisation. Working in remote and rural areas in Australia is a good start to help you get diverse experience. Be open to getting teaching and public speaking experience. And always treat your team with care and respect. In MSF the learning goes both ways; our local staff have so much to teach us too.